If you are having a large outdoor event that requires the use of a porta potty rental, then a portable hand washing station is a legal necessity for your portable restroom rental needs. Although technically, a hand sanitizer stand set near a porta potty or a food booth is also helpful, hand sanitizer alone is not as effective as washing your hands thoroughly at a hand washing station. It is a well-known fact that people may feel safer at large outdoor events if they can wash their hands before eating and clean up scrapes properly. 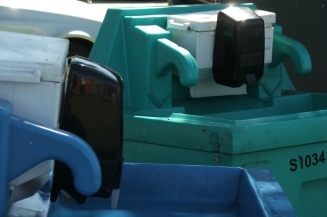 Here are our top fur reasons why renting a hand washing station is beneficial for your event. In order to properly wash one’s hands and prevent the spread of bacteria and sickness, then people need to have enough space to physically perform the task of washing their hands. While some porta potties come with “sinks,” these are usually not as sufficient as the benefits that a hand washing station can provide. A portable hand washing station provides users with a deep reservoir sink that allows enough room to wash the hands, wrists, and arms if needed. The space that comes with needing to wash your hands properly also includes other amenities that place hand washing stations over other cleaning options. Hand washing stations usually come equipped with anti-bacterial soap and paper towels to properly wash and dry one’s hands. One of the main aspects of washing hands properly involves killing germs by using hot water throughout the process. Yet another benefit to portable sinks is that they are able to heat water and allow people to have access to hot water when cleaning themselves off. The hot water in a hand washing station is provided by a heat exchanger that is installed within the unit. Once the unit is plugged in, the heat level in the unit is able to be changed to match a desired setting. When setting up amenities for individual events you need to consider the food to guest ratio. People are going to eat, go to the restroom at your porta potties, then most likely begin eating again. Improper hand washing is one of the leading causes of food contamination at parties. If someone is even a little sick, they can send quite a few people home sick simply by not washing their hands properly. Staying clean means being disease and germ-free. This means that nothing is able to be spread that can get other people sick. At Got To Go Solutions, we know that being clean while using the restroom is extremely important in general, and even more so at large social events. Don’t rely on germ wash to keep your hands clean. Make sure that your next event has a couple of rental portable sinks to keep your party clean. Get in touch with us today to find out more about our products.